The case in which UPND leader Hakainde Hichilema is charged with the offence of using insulting language continued in court today. Below is the word for word Cross-examination state witness Musamba Chime. Defence lawyer Keith Mweemba: We ended when you were talking about your report and investigations. According to your investigations, how was the root lining done? Who was in charge? Defence: Okay, how was the root lining done? Defence: Your job is to answer the question. How was the root lining done? Defence: So you did not investigate? If you had investigated you would have known? And yet you arrested him and charged him for treason without investigating? Is that how you do things? Magistrate: Are you also the one who investigated treason? Witness 3: Yes Your Honour. State: Your Honor may I be guided, of what relevance is that question when the offense before this court is not treason? Defence: I will answer Your Honour. We can make available the Supreme Court decision… and my brothers can read and understand the relevance of this question. And we didn’t want to preempt that this record and the record before Honourable Simusamba will be used in the treason case and we also want to show bad faith that a citizen can be arrested without investigation and charged for an offense punished by death. Magistrate: (asks state advocate) What discussions are you having with the witness who is on the stand? Magistrate: (after a moment of writing his ruling) I have examined the states concern on questions arising for the other charge which has been separated…I perceive no malice from the defense because the arresting officer is the same from the other case. He is in a position to respond and if he doesn’t it will adversely affect the proceedings of the other matter. A witness cannot choose what questions to be asked. (Cites relevant cases) there is no limitation on cross-examination. Issues aught to be properly understood. Muna Ndulo is the prime authority; cross-examination is the greatest invention ever made in discovering the truth. Defence: According to your investigations, how was root lining done for you to charge someone with a capital offense? Defence: so you arrested without knowing? (Shows him an exhibit in a Habeas Corpus case involving HH in which he was the arresting officer again) This was signed by you right? Defence: And you made up your mind you were satisfied to charge and arrest right? Defence: Since you have said you didn’t investigate? On who’s superior orders were you acting? Defence: Tell the court the space between the officers on that Limulunga road in terms of meterage signifying that the president was going to use that route? Magistrate: What is your answer? You don’t know if there were officers? Witness 3: I don’t know; I wasn’t there. Defence: But you investigated. Since you recorded a statement from Mr Ndalama what did he tell you? What happened in terms of route lining? Defence: What did Mr Ndalama tell you? Defence: So you effected an arrest without recording a witness statement from Mr Ndalama not so? Defence: Then according to the report, how was root lining done? Defence: You didn’t read the report but you effected an arrest? Defence: But you effected an arrest on a capital offence? Defence: Did you tell this court your duties yesterday? Defence: So on what basis did you make up your mind to charge and arrest for all these cases since you didn’t investigate? Defence: What are those investigations? How many times did you visit Western Province? Defence: Were you on duty on that day? Defence: Do you know how to investigate? Who was the commanding officer? Defence: You didn’t record a statement from him did you? Defence: But I put it to you, you only started your investigations on the 9th not so? Defence: If you are alleging that an offense in this court happened on the 11th, surely it doesn’t make sense that you started investigations on the 8th not so? Defence: So your being in Western Province had nothing to do with treason not so? Defence: So you have never been to western province to go and investigate treason? Defence lawyer Gilbert Phiri: Just to add, this witness is a witness of fact. This witness was asked something which demands a factual answer. So we have serious concerns. And the state did not object. Magistrate: You should have objected to the leave of the court for them to confer. State: Can we continue just for a minute then he can be subjected to continued cross-examination. Magistrate: in the interest of justice, I will allow cross-examination to continue and if you deem the question unfair, you can rise to object. Defence: Do you agree with me that a person can overthrow a government through legal means? Magistrate: do you have any legal training? Witness 3: It sounds like my name is being demeaned. I have some basics. Magistrate: When issues are before court, it is not demeaning. I don’t want you to be subjected to certain questions which your training cannot cover. It is not meant to demean you. Your counsel is an advocate like him (defence) and he can rise to protect you if the question is unfair. Defence: I will rephrase and get what I want. You are aware that this witness (pointing at HH) has challenged the presidency in court? Defence: When was the matter before Mwila Chitabo thrown out? Defence: Challenging an election in court is not illegal and can never be treason not so? Defence: You have no evidence that the accused has ever talked of overthrowing government using unlawful means? Witness 3: I can’t give it hear. Under 9the case of) insulting language? Defence through Mwiimbu: You may recall that yesterday a report was circulated and was used by counsel and that does not separate the issues. He can’t start selecting what he can comment on and what he can’t comment on. These cases are connected and that is why there is only one report. Further, there is no evidence before any court on these issues we are raising and these issues will determine the credibility of the investigations which this man carried out. 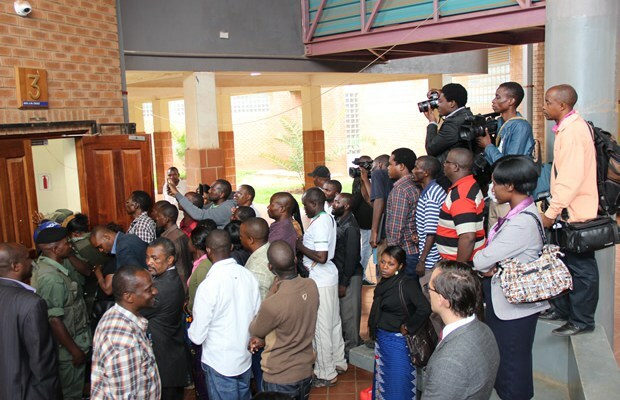 Defence through Mweemba: There’s no law which stops us from cross examining him on this point. His credibility must be challenged and any other court can use the record of this court. And the ruling this afternoon will be about this case. Magistrate: That ruling will be given tomorrow morning… The witness can only comment on certain issues but he can’t aduce evidence in this case. Defence : We will go by the courts guidance, kindly comment in a general manner what evidence you have. Magistrate : I can’t begin receiving evidence on treason. I have guided and if you don’t comply, I will transfer this case to another court. Defence: Obliged. What was your dress code on the 11th? Defence: You were in civil? Defence: So you don’t expect anyone to guess you’re a police officer right? Defence: Do you agree that if you overlook certain things in your investigation it amounts to dereliction of duty? State: Objection, that question is out of order. This is a witness of fact, not an expert witness. Magistrate: Does he even know what dereliction of duty is? Defence: So you were answering without knowing what it means? Defence: Okay, we will move on to the next point. I’m curious, English is a language, Bemba is a language among others. What language is insulting? Defence: What about insults, insulting words? Defence: This arises from what you were investigating from the 11th. According to you the route was clear not so? According to your report? Witness 3: Your Honour, you are still coming back to the same question. Defence: Was the route cleared? Do you know or you don’t know? Defence: And as you answer, we have video evidence and statements from government. Defence: You detained the accused at Lilayi, is it gazzetted? Defence: You have not produced this evidence in this court to exclude the danger of false implication or fabrication have you? Defence: You remember yesterday testifying that on the 9th, you were assigned to investigate, who assigned you? Defence: Where is he based? Defence: You didn’t mention that you were at the accused residence on the 10th of April at 22:00 hours not so? Defence: So you were not at his residence around 22:00 hours? Defence: Could I have the report we looked at yesterday? Defence: Could I have the report please? Defence: You authored that not so? Defence: Now you told the court you were not at the house but your own report suggests the opposite, which is the truth? Magistrate: Now I will take action. You have deliberately told lies in court. Let me be fair to you, what do you mean? Magistrate: It’s not worth lying in court. And what I do in this court has to be legal. I am going to follow the due process of what happens when a witness wantonly misleads the court. If it is not your own report, I would have given it a benefit of doubt…then you want to argue with me? No! Repeat what you said. Witness 3: It was in an operation. But it is me who pursued him and in an operation there are a lot of police officers involved so at the premises or at his house I was not there. Magistrate: So this is the whole submission? Magistrate: Any more questions from the defense? Defence: In your report you said you pursued him to his residence not so? Defence: Where did the pursuit start from? Defence: Was it a hot pursuit? Was he driving? Defence: So this report is not the correct version of your involvement at Mr Hichilemas house? Witness 3: I was not at his house. Defence: What do you want the court to believe? Your report or what you are saying? Witness 3: I used the word I pursued; I didn’t say I went to his residence. Defence: In paragraph 6, you stated that you apprehended four other individuals, where did you apprehend them? Defence: But you are the arresting officer? Defence: Are you the one who apprehended them? Witness 3: No, I wasn’t there. Defence: In your pursuit of Mr HH, were you with Mr Chime ? Defence: What about Mr Hamweene ? Defence: Okay who were you with? State: The state is uncomfortable that the court wants that report. It is not before this court as evidence. So we don’t know how the court wants it. Magistrate: The court has the authority to get any document that is relevant to a decision which is to be made. A serious allegation has been made and to make an informed decision, I need it. There are very relevant authorities. State: Obliged but during reexamination, we will wish to let him clarify. Defence: We have cause to suspect that the witness is carrying a firearm. Can we inspect him? Magistrate: He has not shown cause that he will attack anybody. He cannot be searched. Witness 3: In not comfortable because the defense counsel has continued accusing me. Let me be searched. Magistrate: Let me guide you, when issues are given in court and a ruling is passed, then it moves on. I have already addressed this matter. If you are not comfortable why are you a witness? State: We concur with the defense that we proceed to chambers. That is our position as well. State: Before we continue, our witness would like to address the court. Witness 3: In the first statement which I gave, I said I pursued Mr Hichilema to his residence at house number 10747, I was at the premises on the 10th of April past 22:00 hours though I didn’t enter. Then I pulled out and went back. And. Came back the following day on the 11th around 09:00 hours. As such your honor I seek for apology. It was not my intention Your Honor to mislead the court. You know Your Honor I have been standing for a long period of time, therefore I seek for apology Your Honour, I rest my apology. State: That is the position as stated by our witness. Defence lawyer Mwiimbu: Your Honor we have taken note that the witness has apologized for having misled the court pertaining to the happenings of 10th April and the apology is now part of the record and we accept it Your Honour. Defence (Phiri): You were at HH’s house with a mission to apprehend him not so? Defence: Who were you with? Defence: Would you care to name them? Defence: You are aware that the house was stormed not so? Defence: You have said you were at the residence not so? Defence: But you want this court to believe you are not aware that police stormed the house? Defence: Okay are you aware [that] hundreds of officers went into the house? Defence: I don’t want us to go where we are coming from. I will navigate it this way. Where were you? Defence: How long were you there? Witness 3: Myself, I was there for a few minutes. Defence: Where were those other assignments which were so important? Defence: Was it on the same night that you apprehended the other four accused? Defence: Outside the gate of Mr Hakainde Hichilema? Witness 3: It is not me who apprehended them. Me I charged them. Defence: And I’m sure Mr Chirwa also left? Defence: You were with him? Defence: Were there other people apart from police officers? Defence: You know Garry Nkombo? Defence: Did you see these two persons there? Defence: Did you see tear smoke? Defence: You never saw damage being done to the house of the accused person? Defence: You said you came back in the morning right? Defence: You said it was because you received intelligence information that a group of people wanted to cause confusion during the operation. Which operation? Defence: When you reached, you found that there was no disturbance not so? Defence: And you didn’t find the group which was there to disturb? Defence: Having found that calm situation, you decided not to leave the premises not so? Defence: You arrived at 9hours right? You left at 9? Defence: Why did you stay? You said you were not the one leading the night operation not so? Defence: There was someone else leading the night operation not so? Defence: So having found it calm, there was no reason for you to stay not so? Defence: When you arrived in the morning, was the gate still standing? Witness: It was still firm, it was standing. Defence: You said you were there to apprehend him not so? Defence: Despite someone else leading the operation? Defence: Have you had any interaction with him (pointing at HH)? Defence: So there’s no reason why he should insult you not so? Defence: When did you leave? Witness 3: In the night, I can’t tell the exact time. Defence: What time did you arrive in Lusaka? Defence: What time did you report for work? Defence: You said you were assigned a docket of the current cases. Who opened it? Defence: You want the record to change? Witness 3: Those words are used interchangeably. Defence: Who was the complainant? Defence: So you recorded a statement from the state? Magistrate: Are you giving me an impression that the complainant was you the police officers? Defence: So have you recorded any witness statements? Defence: Do you have reports recorded from independent people? Witness 3: Yes, from some private media. I can’t remember. Defence: On the 11th, how close were you with Mr Musamba Chime? Defence: When HH came out of the car you came out of the house you went into the yard? Defence: And he was very close? Defence: So what he heard you heard? What insults did you hear? Defence: If Mr Chime came and said he heard “take out these dogs” would he be saying the truth? Witness 3: I heard your honor. Defence: Why didn’t you tell the court at first? Defence: What were you carrying ? Defence: So you didn’t carry a pen? Witness 3: From the answer, I mentioned only a note book. Defence: And in this court you have not produced any accurate record of the words which the accused is accused of saying? Witness 3: The records which I recorded during the same operation? I haven’t produced your honor. Defence: It is also correct from your evidence that in fact there was no request made to you for reinforcement by the officers who were there? Defence: And from your evidence, there was no handover so that you could be the one to arrest? Defence: You just imposed yourself? Defence: So you usurped the powers of those who were there? Defence: Therefore, when you left, your mission personally was not to arrest not so? State: What was the purpose of you remaining at the premises after finding the situation was calm? State: They also asked whether you investigated or not, what is your explanation? State: You were asked if you recorded statements from other members of the public, you only recorded from TV, explain.